Home > Products > ChargeIt by Jay Sunray Gold Melamine Charger Plate 13"
Add a stylish and eye-catching accent to your dining table with the ChargeIt by Jay Sunray Gold Melamine Charger Plate 13". 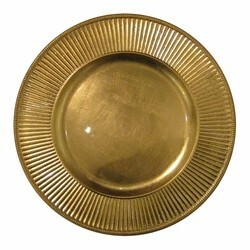 Featuring a unique, classic sun-ray design in a lavish gold hue, this charger plate is an excellent choice for enhancing food presentation at formal catered events, wedding receptions, and more. Thanks to its premium quality melmaine construction, this charger plate boasts superior craftsmanship for unbeatable durability. This charger plate has ample space to accommodate any size plate.